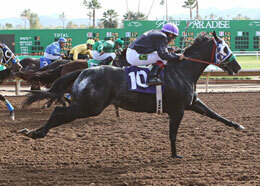 Mokara, under jockey David Reyes-Frisby, gets a new track record for 100 yards on Saturday at Turf Paradise. PHOENIX, AZ�DECEMBER 21, 2013�Rey Moreno's Mokara set a new track record Saturday afternoon at Turf Paradise while defeating Pr Waverrunner by a nose in the $11,300 Dashing All The Way Stakes (not black-type). Ridden by David Reyes-Frisby Mokara covered the 100 yards in a quick :06.516 seconds into a 8 mph headwind. The previous record of :06.602 was set December 23 by Shez My Lucky Charm. Saddled by Gilberto Hernandez, the brown Ivory James filly picked up her fourth win in 14 starts and the $6,726 winner's purse pushed her career total to nearly $30,000. Bobby D. Cox bred Mokara in Texas from the Brimmerton mare Brimmertons Chick. Alejandro Perez Sanchez saddled Pr Waverunner for owner Juan Robles. Rodolfo Arvizu rode the Wave Carver gelding out of Leading Asset, by Special Leader. Bred in Alberta by Kyler Racing, LLC, Pr Waverunner earned $2,170 for the effort. Mackies Wagon finished a neck back in third for owner Ricardo Biebrich and trainers Cesar Lopez. The Pyc Paint Your Wagon gelding, ridden by Emilio Tapia, earned $1,085. Angela Maria Aquino bred Mackies Wagon in California from the In Excess (TB) mare Deer Mackie. Completing the field were Black Storm Regard, Too Cool To Rule, Blues Man Won, Kellys Cartel, Just Thoughts, Sheez My Lucky Charm.